Welcome back to another great day of sneaks! BUILD A SUNRAY & MORE STITCHED CIRCLES. So happy with both these sets, the Build A Sunray has some awesome patterned ray stamps, I used the dots here. It also has a die which is the black cardstock under my circle. The Stitched Circles which I used here for my sentiment coordinates nicely with the Bunch Of Fun Circles, the black layer is from that set. I also used the cloud die from the More Stitched Edges dies to create the background and the Stitched Rectangular Frame dies to cut out the cloud background. For the sunrays I used Ranger dye ink so you can see the clouds in the background on some of the colors especially the yellow which I love. Love your card. This is one of my favorite releases. Adorable card! I love the polka dotted sun rays, so fun! Love your colorful card...awesome sentiment. Absolutely beautiful. So colorful. All suns should be this color! Love your colorful sunray, so inspiring! Such a pretty and cheerful card! Wow, that is so pretty. Love the beautiful colors. Another amazing release. You all did a great job this week. 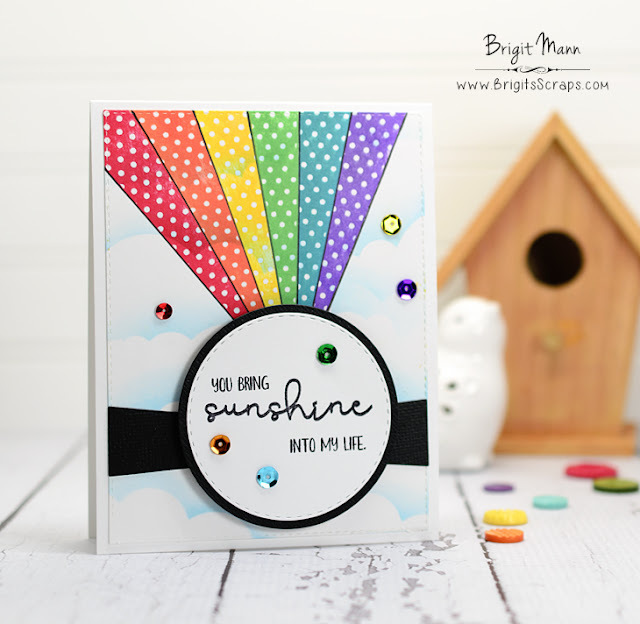 Love the bright and colorful rainbow of rays you made on your bright and sunny card. It's enough to lift anyone's spirits. Love your bright and colourful card! Your clouds look amazing! Love the new circle dies, can't wait to purchase mine! Such a beautiful rainbow of rays. I like how the clouds show through them. Great cloudy sky too. Beautiful job. Cute--love the rainbow of rays. Love the cloudy background and the beautiful rainbow rays!! Love your pretty rainbow colors! This new die looks like fun... gotta have it! I really like the cloud background and how you used the stitched edge die. OH My Goodness What a Super fun card!